Provide comfort for the family of Lorraine Mysliwski with a meaningful gesture of sympathy. Lorraine Ruth Mysliwski (nee Peterson), child of God, went to meet her Savior Tuesday March 5th 2019, just shy of her 89th birthday. She is survived by her children Barbara (Bob) Naffier, Paul (Cheryl) Mysliwski, Tony (Nancy) Mysliwski and Carol (John) Jackson as well as her grandchildren April (Joe) Folgert, Robert (Rhonda) Naffier, Nancy Marie (Brian) Farr, Paul (Stephanie) Mysliwski, Aaron (Crystal) Mysliwski, Alan Lastufka and Mark Lastufka, great grandchildren Ben, Sara, Jaxson, Tinley, Caleb and Karsen, beloved sister Dorothy Engel, nieces, nephews, cousins, friends and neighbors. She was preceded in death by Felix, her parents Wilma and Willis Peterson, sister Evelyn Nowak, brother Bob Peterson, and grandson Brad Mysliwski. Lorraine was a long time member of Ascension Lutheran Church in Milwaukee living her faith as deaconess, choir member, wedding coordinator and volunteer office help. 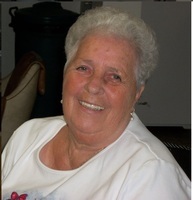 She loved cooking, gardening, socializing, traveling, playing bingo and visiting with her family. Lorraine was from the Greatest Generation, saw many changes and overcame many challenges in her life all with innate grace and a beautiful smile. That smile is now shining down on her family. She raised strong children who have passed that strength onto their own children. We were blessed to call her Mom. Visitation Friday, March 22, 10-11 AM at Schramka-Borgwardt Funeral Home, 11030 W. Forest Home Ave., Hales Corners, followed by a Funeral Service at 11 AM. Private inurnment Highland Memorial Park in New Berlin. Lorraine’s request for memorials are to Ascension Lutheran Church or St. Jude’s Children’s Hospital. To send flowers in memory of Lorraine R. Mysliwski, please visit our Heartfelt Sympathies Store. Highland Memorial Park - Private family inurnment. Provide comfort for the family of Lorraine R. Mysliwski by sending flowers. Thank you for sharing your heart, Sally. She adored you! Grandma (Granny or Grams I affectionately called her) was a strong lady who had some challenging seasons in her life, yet she remained strong in her faith. One of the many ways she’s blessed me is by passing down amazing recipes I’ve learned and continue to enjoy with my family. Of course, there are may other ways she’s blessed me. She will be greatly missed by her family and friends.